A party isn't a party without the Fill 'N Chill Party Table. 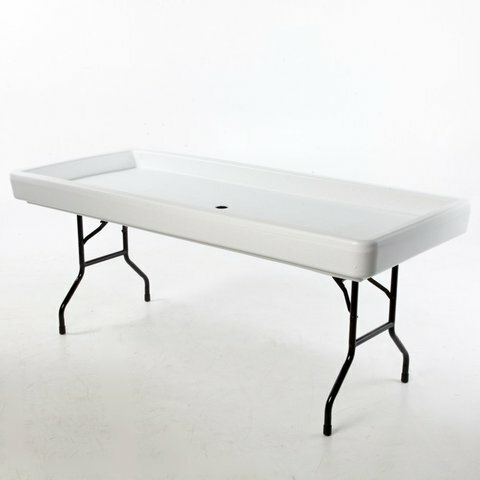 This table is designed to be filled with ice to keep your food and drinks cold and fresh throughout the party. It's made of high-density polyethylene with powder-coated steel legs. the Fill 'N Chill makes all the difference at both outdoor and indoor use. Exterior Dimensions: 73L x 31W x 6.5H in.. Interior Dimensions: 69L x 29W x 3.5H in.. Fill with ice and keep the party favors cool. corners and smooth edge. Weight capacity: 200 lbs..